Super Fiber Salad. Spring is here, and it is time for fresh salads! Actually, salads are one of my all time favorite meals, so I will find a way to work salads into my eating plan all year round. It is so much easier to make salads in the spring and summer though, because you have the benefit of fresh vegetables and herbs. 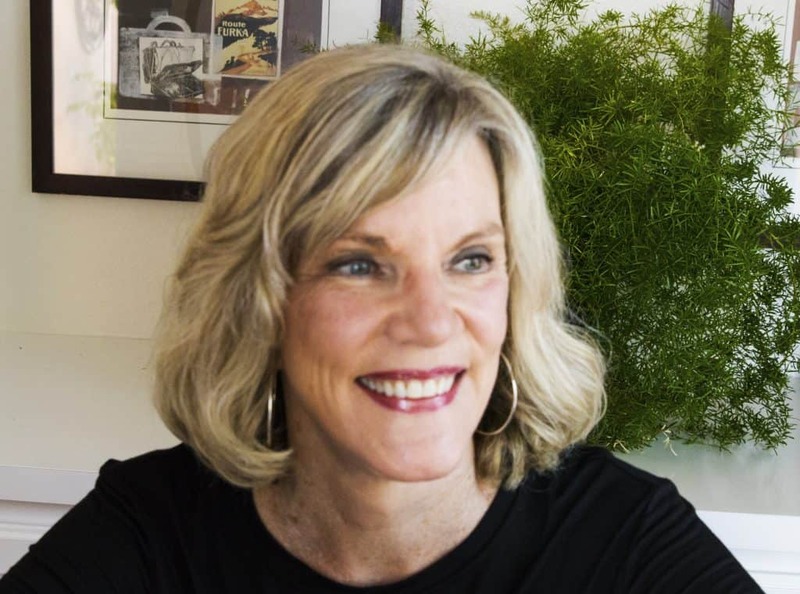 For me, I grow some of my own vegetables and herbs in my own Patio Garden and am always excited to create recipes to use them. I am sure that the farm and garden experts already know this, but I was completely blown away by how much better fresh from your garden herbs and vegetables taste! What Are The Best Ingredients For Salad? 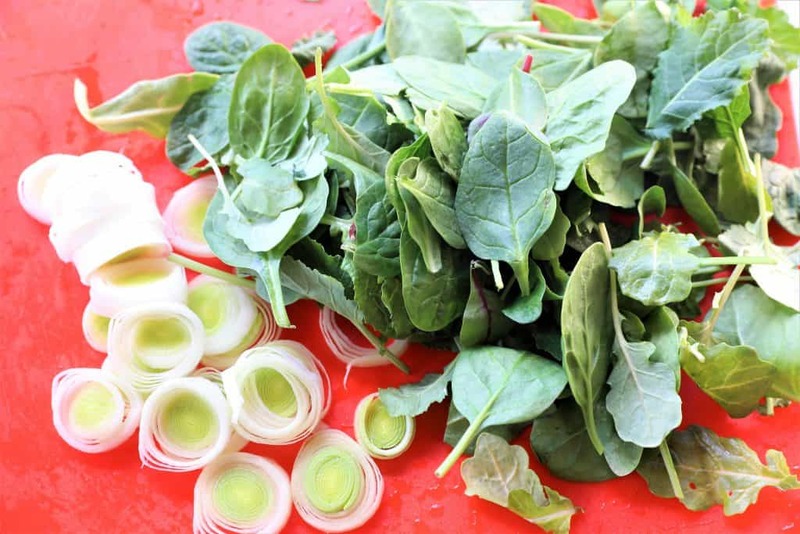 Generally, when making a salad, you are going to use some greens for the base of your salad and add other ingredients, both sweet and savory. In this salad, I used home grown purple kale and spinach for the greens base. To add savory flavor, I also add some roasted vegetables, in this case, butternut squash and maple glazed beets. For sweet flavor, toss in one green apple. I like to add green onions or leeks, and always, top the salad with some crunchy nuts. Here, I used pistachios. 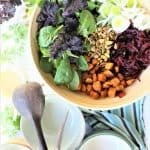 How Do I Get More Fiber In My Salad? 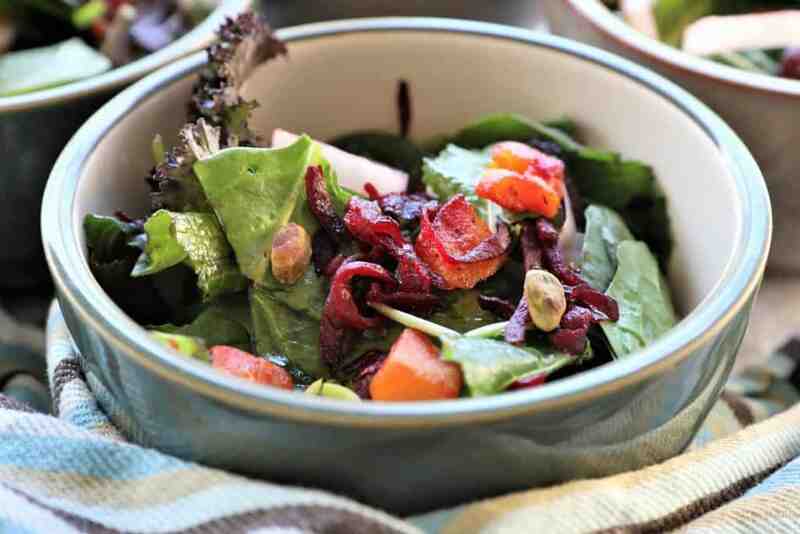 Regardless of what meal you are preparing, beets are one of the best foods to include. Root vegetables such as beets or onions have added nutrition because they are grown underground. 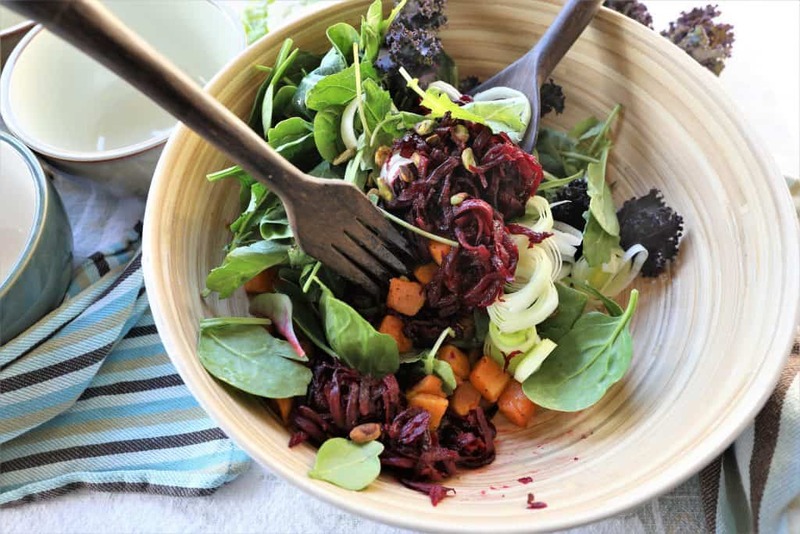 (source) I used this recipe for Maple Glazed Beets to add to this salad, but you can also use it for a side dish with any other meal. 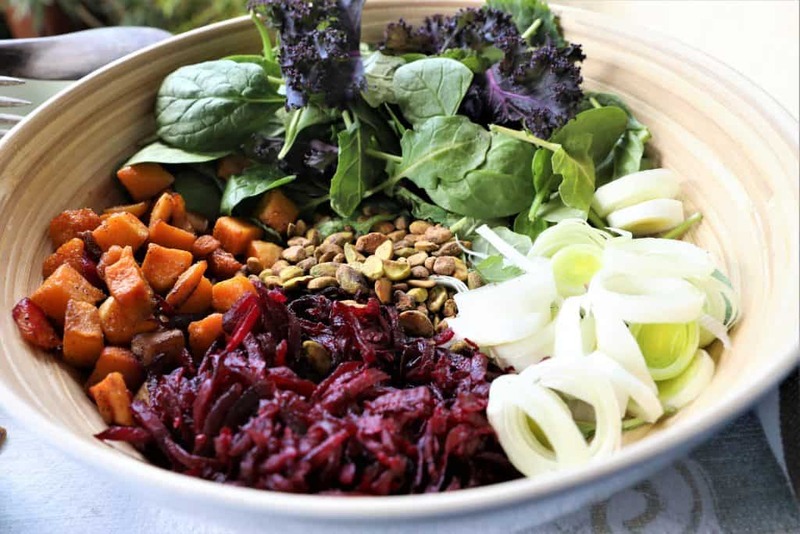 Additionally, for this Super Fiber Salad, the beets are the star when considering fiber, (3.8 grams of fiber per cup) and are considered one of the healthiest foods on the planet. 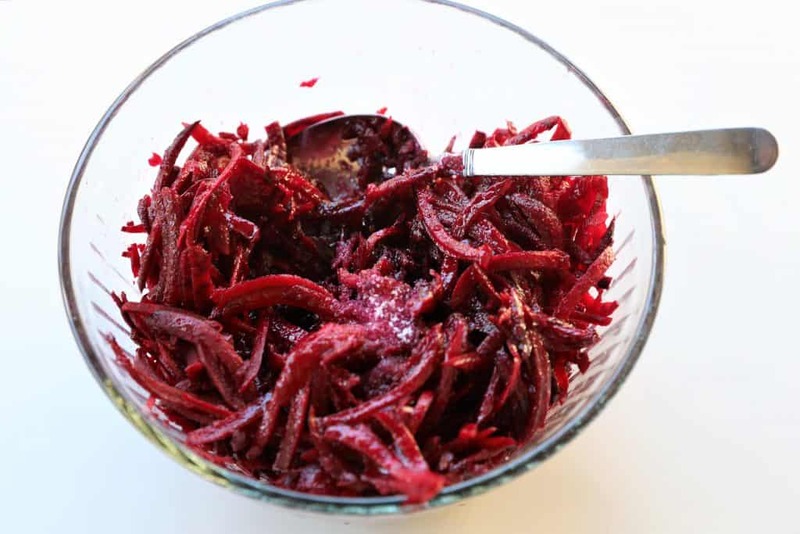 Additionally, beets have beta-carotene and betalains, which have an antioxidant and anti-inflammatory effect. It is true that colorful fruits and vegetables are good for you! Does This Salad Need Dressing? After you bake the glazed beets, you will have some liquid from the maple syrup and coconut oil. 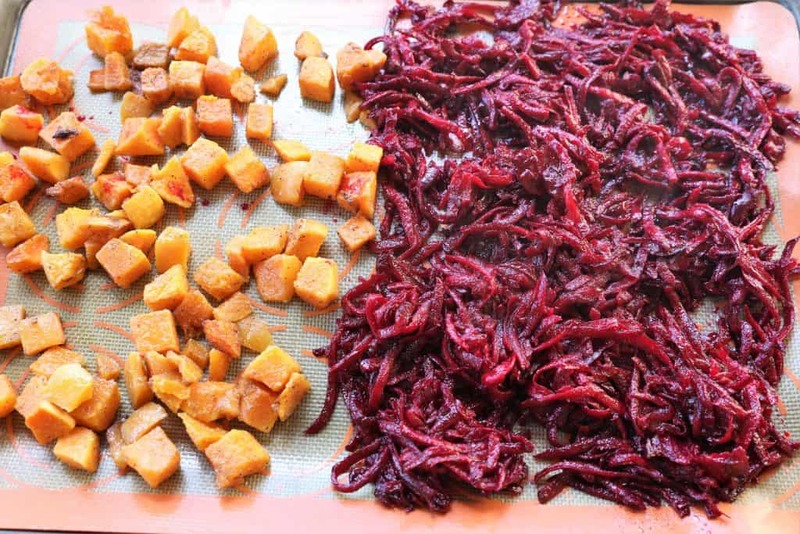 When I add the beets to the salad, and toss the ingredients, this sweet flavor then creates a dressing that is enhanced by the flavors of the butternut squash seasoning. It is very light, and in my opinion, tastes great without added dressing. If you prefer however, you can add a light vinaigrette, which you can make with oil and lemon juice. 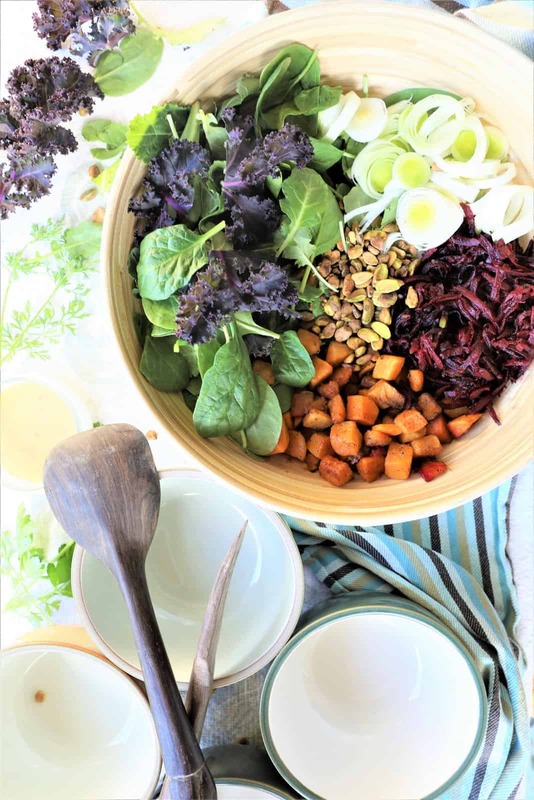 Spring is here, and it is time for healthy, delicious salads! Packed with nutrition and fiber, this salad will become a tasty favorite. 4 cups mixed greens, kale, spinach, etc. Shred beets and microwave for 1 minute. Let sit for 1 minute and drain water. Add coconut oil, salt and maple syrup and mix. Bake at 400 for 20 minutes with squash. Spread squash on baking sheet with silicon mat. Drizzle with olive oil, salt, pepper and granulated garlic and mix. Add beets to same baking sheet, separated from squash, and bake at 400 for 20 minutes. While vegetables are baking, slice leeks and toast pistachios in pan for 2-3 minutes on medium heat. Set aside. Add greens to large bowl, mix in baked glazed beets, roasted butternut squash, sliced leeks and pistachios. Mix well. 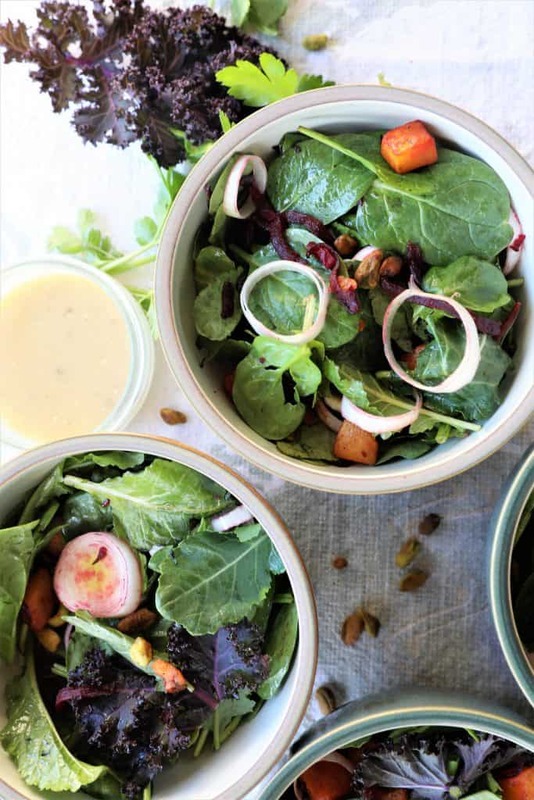 This salad doesn't really need dressing because of the maple glazed beets, but if you like dressing, choose a light vinaigrette. 1. My greens include kale, spinach and chard. I grew the purple kale in my Tower Garden. 2. This salad will serve 4 as a side salad or 2 as a dinner/lunch salad. 3. The beets in the photo are not 1 cup but 4 cups. I like to add the beets to many dishes.